Driving through the industrial area near the Toronto airport, you would never guess that Jay Lloyds, one of the most experienced Porsche specialists in North America, would be tinkering away at his shop down the road. With over 44 years of experience working with Porsche’s around the world, he now runs Jay Lloyds’ KlassiX. It is a specialty shop that focuses on maintaining, restoring, modifying and building classic Porsche’s. Jay invited me to check out his shop and chat about his passion for the classics, his extensive experience with Porsche motorsports and just cars in general. Born and raised in Australia, Jay was hooked on motorsports as soon as he heard the engine roaring from a local race track. Like most of us, he was immediately drawn to the sights, sounds and smells of racing. Armed with a strong mechanical aptitude, he began working on various motorcycles and cars for local race teams. He also raced his own Kawasaki 750 2 stroke motorcycle. The defining moment of Jay’s career came when The Werks Porsche Team brought a 1973-74 911 Turbo 2.1 RSR to the Philip Island Race Track in Victoria, Australia. It was love at first sight. He was blown away with the Porsche’s speed and sounds as well as the way it left Australian V8 muscle in the dust! Everyone there was in shock, yet also in awe. At age 21, Jay realized he needed to leave Australia in order to take his career to the next level. He moved to Hong Kong to join the Zeiss Racing and Flying Tigers Teams, winning multiple Asian Championships in the process. Eventually Jay followed Porsche home to Germany and joined the Roitmayer GMBH Racing Team. He was determined to absorb as much knowledge as he could while working with top level Porsche motorsport programs. This meant putting in 18 + hours every day of the week to gain valuable experience which he continues to use 44 years down the road. Over the years, Jay has worked with iconic Porsche racecars such as the 956, 908’s. This also includes various iterations of the 911, including the RSR, 934, 935 and others. He even assisted in restoring the 917/30 Sunoco car for Alan Hamilton, the Porsche importer to Australia at the time. Despite being a Porsche die-hard at heart, Jay also has a passion for motorcycle racing. During his time in Munich, he built and prepared motorcycles for Ernst Gschwender. They competed in the very demanding GP 500cc Championship (now known as MotoGP) and German GP500 Championship series, which they eventually won. Jay returned to Hong Kong with extensive Porsche racing experience. He set up the Lloyds Motors workshop and formed Lloyds Motors Racing Team. The team consisted of a group of handpicked loyal customers that raced all over Asia. They had the opportunity to race in India, Malaysia, Japan, Indonesia and many other exotic locations around the World. In addition to racing, Jay also had a hand in setting up the Porsche dealer in Singapore in the 1980s. He also worked with various dealerships in Australia, Hong Kong and Canada, including a couple of other dealers that he wishes not to mention. One of the most interesting projects that Jay has worked on outside of his Porsche environment was the development of the Motion Concept Vehicle CH4. You may have seen it at the 2017 Canadian International Auto Show in Toronto. It’s an all carbon fiber chassis supercar powered by a Northstar V8 with two mid-mounted Whipple superchargers. The engine was extensively modified to run on natural gas, but could be converted back to normal gasoline upon request. While Jay agreed it was a great setup, his preferred engine was actually a Porsche 928S4 GT V8 modified to a twin turbo setup. As with most things in life, the people paying the bills have the final say and went for the cheaper option. Jay did get his way with the transmission and stuck with what he knew best. He chose a Porsche 5-speed manual because it’s lightweight and so strong that it would take a “moron driver” to break it! Unfortunately, due to a variety of factors the MCV CH4 never made it into production. Had the project gone ahead, it would have been the first true supercar to come out of Canada! A few years after Jay decided to stay in Canada, and opened Jay Lloyds KlassiX – a shop focused exclusively on classic Porsches. Jay Lloyds KlassiX is tucked away in a low key commercial district in Mississauga. The shop offers everything from basic maintenance to complete custom builds. The facility also includes a machine shop with custom fabrication equipment. In addition to services, Jay Lloyds Klassix is one of the few Ontario distributors of Gulf Oil lubricants (which Jay swears by) and Electromotive engine management and ignition system products. He is also the only distributor of AUTOart Wheels, the same company behind the beautifully detailed die-cast models. Only the best goes through Jay’s hands. Speaking of Gulf Oil, you may have seen their logo on iconic racecars like the spectacular Porsche 917K and the striking Ford GT40, both monsters in their own right. To this day, they still draw thousands of spectators to salivate over their imposing aura. Gulf, what’s to be said, Jay swears by the stuff. He exclusively uses Gulf engine oil, brake fluid and gear oil. He even uses their coolant on the few water-cooled cars that he works on such as the 924, 944, 968 and the 928. Check out how awesome the Gulf Classic motor oil packaging looks! These cans would look amazing sitting on my garage shelf. An interesting tidbit he shared with me is that classic Porsche’s do not run well on synthetic oil. They require thicker mineral oils due to the looser tolerances of the older engines. In contrast, modern cars generally have very tight tolerances which require the use of much thinner synthetic oil. When used with synthetic oil, the older pumps can not build the internal pressures to cope with the demand of these older, high horsepower motors. After building a career from working on air cooled Porsches, Jay has chosen to stick with his passion and focus solely on the classics. Porsche 993 – the last of the air-cooled 911. The 993 generation Porsche 911 marked the death of air cooled engines for the manufacturer. Much to the dismay of purists, Porsche introduced water cooling when they unveiled the 996 at the 1998 Frankfurt Auto Show. As a guest of Porsche, Jay stood next to Herr. Wendelin Wiedeking on media day. As the fancy lights and girls did their high-tech introduction they lifted the cover off the new 911. Jay’s jaw dropped straight to the floor, for all the wrong reasons! He could not believe his eyes. Air cooling was considered to be one of the defining characteristics of the iconic 911. Making the drastic change to coolant cooled engines for the new 911 was arguably the most controversial move ever made by the automaker. Jay chooses to devote his time and energy on classic Porsche’s to keep the quality of his work at a high level. After working on them for the past 44 years, he has developed an unbreakable bond with these cars. To him, the classic Porsche’s deliver a sensation and feel that just cannot be matched or replicated by the new cars. Being a purist in the truest sense, I did not have the heart to ask him about the Panamera, Cayenne and Macan! The market for Porsche classics has skyrocketed in recent years. In 2016, a 1995 993 GT2 sold for just under $2.5 million at the RM Sotheby’s London auction. Jay also mentioned that the Gulf liveried Porsche 917K that appeared in Steve McQueen’s Le Mans was auctioned off earlier this year for a whopping $14 million, making it the most expensive Porsche in history. Demand for classic parts wasn’t always at this current level. Sourcing parts at this time can be very challenging, especially in Canada. Even though availability has improved, the parts are now very expensive. Porsche understands the love and need that these cars generate and they have no qualms of raising the price accordingly. With this attitude it makes it all the more difficult for the younger generation to get involved because they cannot afford the overall costs involved. Jay decided to build an in-house machine shop, investing in his own lathe, mill, welders and drill press. This enabled him to fabricate custom parts on demand with total control on quality, including intake, intercooler and exhaust systems. Something unique I learned about Jay is that he only does something once. Each of his custom parts are unique and specifically designed and manufactured for a specific application. His clientele really enjoys the exclusivity. I mean, how cool is it to have a Porsche technician fabricate a one-off custom part just for you, someone who actually worked on the racing version of your classic Porsche when it was still actively competing! Many of his projects would not have been possible without this capability. 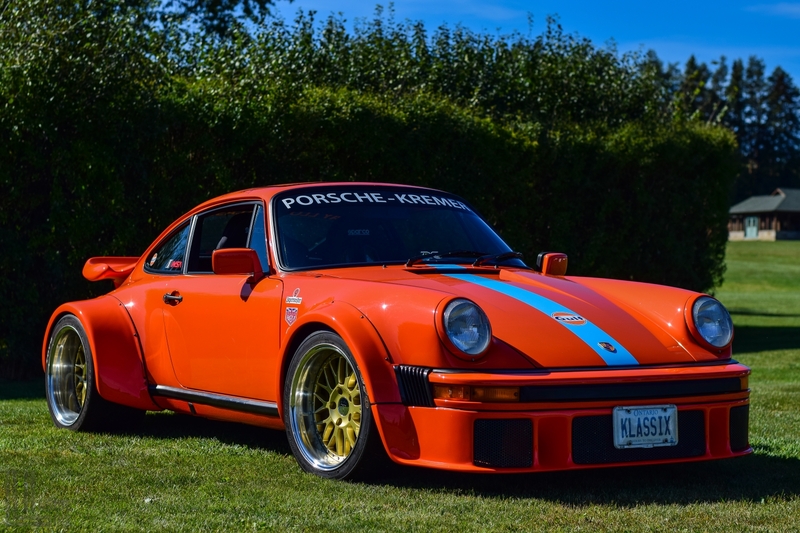 His Porsche 934 Gulf Tribute car would be a perfect example and showcase of his custom work. I first met Jay at the 2014 IMSA United Sports Car Championship race at Mosport. His Jägermeister orange Porsche 934 Gulf tribute car immediately caught my attention from the sea of racecars situated in the paddocks. With big names in the classic Porsche scene such as Magnus Walker, Bryan Singer and Nakai-san at RWB, Jay still manages to bring something unique to the table while staying true to Porsche’s racing heritage. After all, he’s one of the few people in North America that has actually worked on Porsche racecars for the past four decades! His philosophy is to stay true to the spirit of the Factory “Werks” Cars. Each car, whether it is intended for street or track, must have the complete package from the exterior, interior and performance. In other words, it has to be able to snap necks with its looks as well as its speed. The car that best exemplifies his work is his 934 Gulf Tribute. It is the result of two and a half years of labour. Jay spent evenings and weekends wrenching on the car while always prioritizing customer jobs. He estimates that he spent over 400 hours on the bodywork alone! It may sound like a wild number, but it makes a lot of sense when you compare it to a stock body 930 Turbo. He handcrafted and painstakingly fitted the widebody components on the car, hand built the various engines and transmissions that has cycled their way in and out as well as re-upholstered the entire interior. The 934 Tribute is truly a display of Jay’s passion, dedication, experience and skill set. It’s supposed to drive like a wild animal too. I fully intend to take Jay up on his offer to take me for a spin so I can experience it first hand! Jay’s goal for this project was to build the most badass Porsche street rod paying homage to one of his favourite 911 racecars of all time. 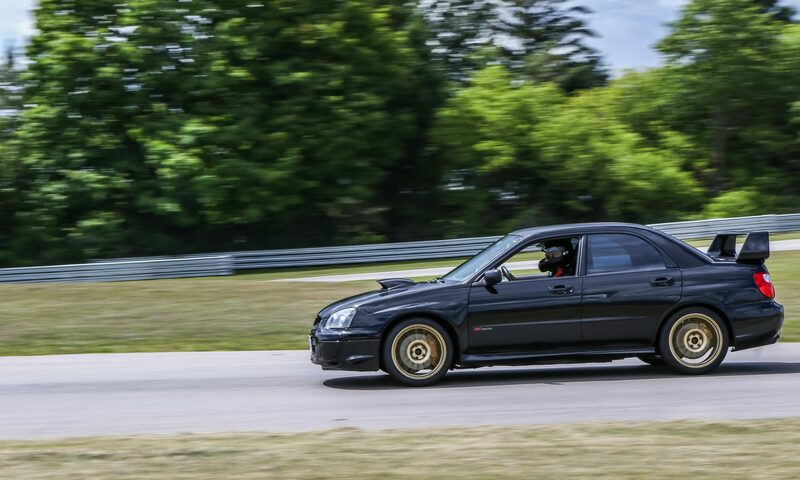 The car has a turbocharged 3.3L flat 6 making about 500hp to the wheels. It’s old school turbo technology so when the boost kicks in, it hits HARD! Power is sent through a good old fashion 4-speed turbo manual transmission, through the shifter he hand-crafted along with an uprated Carbon Kevlar clutch that engages the heavy work. No PDK paddle shifters here! Jay is also capable of rebuilding these tricky transmissions as well. It’s a tedious task that not every shop is capable of or even wants to do. The car has an aggressive stance, yet still utilities the original torsion bar set-up. Jay went with the heavier duty Weltmeister units and Bilstein sports shocks. It’s all business, no Stance Nation fitment here! Tucked behind the widebody fenders are staggered 18×8.5 and 18×12 AUTOart VY 3-piece forged wheels. 315mm wide Toyo R888 tires are the weapon of choice to put all that power to the ground. The widebody and Gulf livery are what really sets this car apart from others. It is a faithful replica of the original 934 racecars with super-wide fenders and whaletail spoiler. Notice how the fenders flow into the stock body. The OEM level fitment looks like it rolled straight off the Porsche factory floor! And that is the point – Jay stays faithful to what the Factory did back those so many years ago. Sadly, Jay has put the car up for sale to fund his next project. Wonder what he’ll come up with next? As the automotive industry continues to evolve, cars like air cooled 911s will become more rare as time passes by. As a result, their ever increasing value will continue to rise. I have no doubt that Jay has the potential to expand his operation if he ever decides to work on the newer cars like the 996, 997 and 991 considering how many of these 911s are on the road today. However, he expressed zero interest in these newer cars and will continue to focus on the classics. It will be a real shame if he ever decides to retire because we will be losing one of the most experienced and skilled Porsche technicians in North America. The scanned old photos you see in this article are all provided by Jay. If you enjoy Porsche classics, follow him on Instagram @jaylloyds. I guarantee you will not be disappointed! Located in Mississauga near Toronto, Canada.